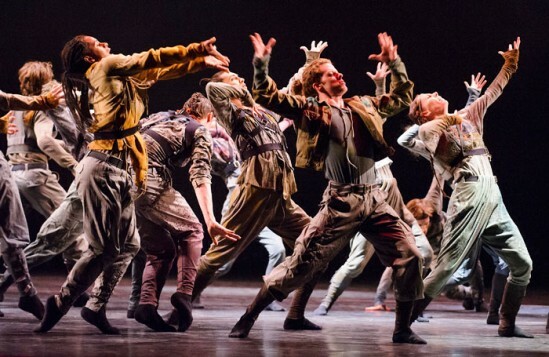 It must be nerve-wracking to be sandwiched between two drop dead masterworks but Hofesh Shechter’s Untouchable emerges unscathed. While it is a long way from his most powerful work its churning, synchronised paramilitary design still packs a punch. As the mixed ensemble – which could represent anything from the Israeli Army to a gang of Ronin – shuffle and stamp, shake their wrists or lope and crouch in unison, small groups attempt to break out and do their own thing. A trio suddenly crouch and stomp like Maori warriors, a heartrending throb of violas replaces the customary thunderous drumming to drive the implacable army onwards, a droning mantra repeats the name ‘Nigel Farage’ over and over again. The final image recalls the Chinese terracotta army brought suddenly to life. Balanchine’s opener is a thing of austere and alarming beauty, set against a backdrop of Della Robbia blue. The themes and variations of Hindemith’s musical interpretation of the four temperaments – or moods of man – offer extraordinary scope for choreographic experimentation. Stripped down to its barest essentials this is ballet stretched into a new form. Highlights include a quartet of hip-thrusting bad girls, Steven McRae’s elasticity put to the service of Balanchine’s jazzed classicism and Zenaida Yanowsky in attack mode during the final variation ‘Choleric’. Finally, a masked Carlos Acosta looks impossibly young as the Death figure in MacMillan’s intense, moving and surprisingly funny ballet, Song of the Earth. Supple, wild, witty – especially in the endlessly inventive exits – it is the perfect synthesis of mythic and modern, classical discipline and mischievous variation.